Dark Nights: Metal Reading Order Tie-Ins! Simply put, the Scott Snyder and Greg Capullo led DC Dark Nights: Metal is the most excited I’ve been about a comic book event since Marvels’ 2015 Secret Wars (aka my favorite comic event of all time). Metal reunites the stellar New 52 Batman creative team in an event spanning a multiverse of Batmen, and honing in on some of the greatest mysteries in the DC Universe (Joker’s true identity, for example). Despite it’s massive scope, Metal is effectively tied into DC Rebirth as a whole, making this the first Crisis level event in Rebirth’s lineup. As new issues of Metal are released, I’ll be ordering them here and letting you know how essential each book is to the event as a whole. You can also find essential comic book history that will help explain Metal’s plot, as well as a detailed checklist of upcoming releases that tie into the event. In all honesty, Metal dives heavily into DC continuity, and as a fan of long and rich comic book universe histories, I’m head over heels in love. 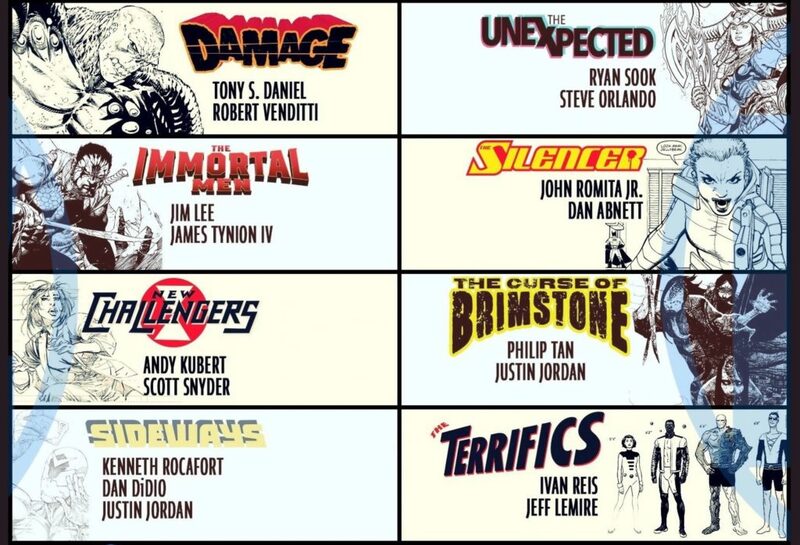 If you’re newer to the DCU, though, or simply missed out on some of the selections below, there can be a lot of confusing moments that don’t have a lot of context. Metal is not pausing often to explain any references, instead opting for the kinetic pace of forward progress. Again, this is great for the story, but not great for understanding what on (multiple) earths is happening. Peter Milligan, Kieron Dwyer, and Jim Aparo’s work on “Dark Knight, Dark City” has been directly referenced in the tie-in issue Batman Lost , and will help explain the early 90’s origins of Metal’s big bad. This story is included primarily for Batman obsessives and completists! Hawkman is crucial to the understanding of Metal? Am I serious? I was skeptical as well, even after Carter Hall made prominent appearances in the Dark Days prelude issues, but Batman Lost ties heavily into characters and stories stemming from Geoff Johns’ run on Hawkman. I genuinely enjoyed and appreciated the reveals of Batman Lost significantly more given the fact that I had read the opening story arc of Johns’ Hawkman only days before. True story: The Return of Bruce Wayne was the only part of Grant Morrison’s run on Batman titles that I had missed. I followed Morrison on Batman, Batman and Robin, Final Crisis, and Batman Inc, but I never bothered with the return. That’s a big mistake if you’re getting into Metal. Reading The Return of Bruce Wayne has seriously augmented my understanding of Metal in many enjoyable ways. It is highly recommended reading for Metal heads. The question really becomes whether or not you need the full Grant Morrison Batman run to understand The Return of Bruce Wayne. While I’d recommend it, all you need for the purposes of Metal is the knowledge that Bruce Wayne gets shot through time in Final Crisis , and needs to find a way to return. Speaking of Morrison, Metal is a giant love letter to the living legend. A full familiarity with the DC Comics of Grant Morrison is always recommended, but for the purposes of Metal, his time writing Batman and his cosmic mapping of the DC multiverse in Multiversity are the most relevant. You can enjoy Metal just fine without Multiversity, but I can say with a good deal of confidence that if you love one you’ll love the other. Also, look for the Multiversity easter egg in the pages of Metal as you go (literally a comics character carrying a copy of the hardcover!). 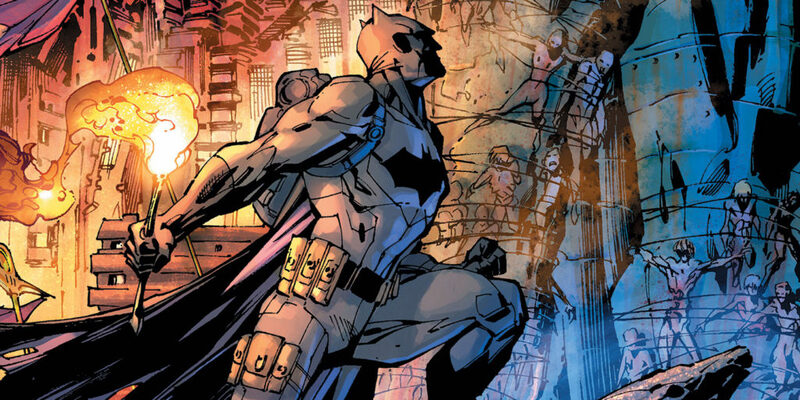 Creators Scott Snyder and Greg Capullo took over the launch of DC’s New 52 Batman and from issue #1 clearly established themselves as the creative team to watch. Over the course of 52 issues, their Batman consistently impressed, and is quite simply one of my 50 favorite comics of all time. As such the entire run is highly recommended reading. If you’re strapped for time, I would recommend you at least check out “The Court of Owls” narrative in Batman Vol. 1 and Batman Vol. 2 , as well as Batman: Endgame . This will introduce you to Snyder and Capullo’s narrative, the Owls of Gotham, this team’s vision of the Joker, Duke Thomas, and the introduction of Batman’s connection to the mysterious Dionesium. The backup shorts running throughout All-Star Batman are great background and build to the character of Duke Thomas, who plays a relevant role in Metal. Thanks to reader Mao L for the tip! Reading the entirety of Darkseid War just to find out what’s up with Darkseid in Metal #1 may seem crazy, but that’s the kind of comic book fan I like! Embarrassingly, I could barely remember how Neil Gaiman’s Sandman ended, and it’s my second favorite comic of all time. “The Wake” will serve as a refresher for those of you as forgetful as me. If you’ve never read an issue of Sandman in your life: 1) Shame on you and 2) I do not recommend starting with “The Wake.” Either go H.A.M. on the run, or just keep calm and Metal on! Please note that the Dark Days issues are also included as individual issues below – I include the recently announced “Road To Metal” trade to call out the less obvious “tie-ins” in Nightwing and Detective Comics. The third and final story in Detective Comics #950 is a short review of Batman’s Rebirth planning, with Tim Drake, aka Red Robin, asking Bruce why he’s preparing for war. There’s then a “Dark Days Are Coming” teaser for Metal. It’s not included in the collection details, but I would also argue that Detective Comics #959 is a good prelude to the “Dark Days” issues. I’d note that “The Resistance” and “Nightmare Batmen” issues will flow a lot better if read in the issue by issue order I’ve suggested below. Hopefully DC will release a complete Metal Omnibus in the future that syncs these two related segments of the story. “The Forge” kicks off Metal with an eons and character spanning story that brings to mind Grant Morrison’s opening on Final Crisis. Don’t worry “The Forge” isn’t quite that overwhelming, but this comic event is definitely exp ecting a high degree of DC Universe knowledge, as well as an infinity for all things Multiversity (yes please). Likewise, “The Forge” will feel more familiar to readers who enjoyed Snyder and Capullo’s New 52 Batman , and are familiar with the revelations about the Joker from Justice League: Darkseid War . “The Casting” continues the exciting stage setting of “The Forge,” and has me insanely pumped for DC Metal! The first two issues of Metal are darn near perfect love letters to the DC Universe, touching on everything from Mongul to the creation of the DC Multiverse! As I’ve mentioned previously, you’ll survive, but the payoff for this Batman centric event will be much greater if you’ve checked out Snyder and Capullo’s New 52 run. THE GOTHAM RESISTANCE & THE DARK KNIGHTS! Hot damn this event is great. The first look into the Bats of the dark multiverse highlights “The Red Death,” a look at a dark Batman with the speed force. If you’ve ever wanted to see Batman wield the combined weapons of the Rogues in a fight with the Flash, this is your chance. The Murder Machine is another great “dark” Batman one-shot. The issue spends about 50% of the time during the present day and 50% explaining this Batman’s origin, making it an essential continuation of the Metal story. I initially placed the Dark Knights one-shots after the “Gotham Resistance” storyline, thinking they could be read in parallel. Green Arrow #32 includes a brief reference to The Murder Machine, though, meaning these issues can be read prior to the 4-part “Gotham Resistance,” which reads best in one chunk. Teen Titans #12 transitions very directly out of the last page reveal at the end of Metal #2. This is part one of the “Gotham Resistance” crossovers, and gives you a good sense of how Metal impacting the DC Universe more broadly. Particularly great read for fans of Damian Wayne! Nightwing’s entrance into the Gotham Resistance connects the dots between the prelude Nightwing #17 issue and the Metal saga. The Gotham resistance continue to fend off the invasion of the Batman Who Laughs and a Gotham turned inside out. Big developments for the Gotham Resistance squad of Damian Wayne (Robin), Green Arrow, Nightwing, Harley Quinn and Killer Croc as they take on the Batman Who Laughs and his creepy Robins. Green Arrow #32 clearly connects to developments from the Murder Machine and helps explain some developments in The Dawnbreaker. My least favorite of the Dark Knights one-shots to date, but still highly relevant to the overall narrative. The conclusion of Dawnbreaker clearly connects to Green Arrow #32, bringing the series together and setting up the Justice League’s tie-ins to come. The Drowned gets the Dark Knights tie-ins back on track, with the story of a gender-swapped DC Dark Earth, and the Aqua-Bat (nobody calls her that, but here’s to trying). Mostly backstory for one of the Dark Knights, with some insight into what has happened to Aquaman and Atlantis in the present day. Another quality one-shot explanation of the “Wonder Woman” Dark Knight. Batman the Merciless ties into the various present day government agencies like ARGUS, Task Force X, and SHADE. To its everlasting credit, this tie-in also includes a Multiversity easter egg, which is easily my favorite panel detail in comics so far in 2017. While Flash #33 is the most direct follow-up to Metal #3, Batman: The Devastator makes the most sense after you’ve already consumed Metal #3. Devastator references specific events that happen in Metal #3, and would otherwise spoil or confuse the main event issue. Devastator feels like a one-shot with real consequences, as the Doomsday Virus Batman invades Metropolis and anyone still placing their hope in Superman. It’s an extremely strong issue and one that has me wondering how the DCU will recover. Flash #33 kicks off the Justice League Metal tie-ins in a story arc titled “Bats Out of Hell.” It was only a matter of time before the Earth-0 Justice League had to take on the dark Bat-versions of their characters, and Flash kicks off those developments in style. Justice League’s tie-in to Metal gives updates on nearly every characters standing in the invasion of the Multiverse, and brings our clearest insight into Cyborg’s situation since Batman: The Murder Machine. Hal gets his own strobing spotlight on his battle with the Green-Batman, aka the Dawnbreaker. The Metal tie-ins continue to be extremely tight and relevant to the overall understanding of the event, with Justice League #33 capping the “Bats out of Hell” crossover. There have been a number of odes to the DC work of Grant Morrison throughout Metal, but nothing more than Batman Lost. You need approximately 7 PHDs in DC-ology to appreciate Batman Lost, and while this will be off-putting to many, the furious pilgrimage through Batman history is an essential part of understanding Metal. Pro-tip: Do not read this deeply disturbing explanation of the Joker / Bats merger directly preceding bed, as you will have endless nightmares (learned that one from experience). Given the insanely talented creative team-up of Jeff Lemire and Bryan Hitch, I wanted to like Hawkman Found significantly more than I did. It’s a fine comic, but with significantly more questions than answers, to the point that I’m not sure how much this issue contributes that the core event wouldn’t already cover. Since Metal is so comparatively tight (for an event), I wouldn’t actually skip, but if you’re strapped for time or cash, you can. The tie-in marks the triumphant return of Grant Morrison to DC Comics, co-writing the issue alongside Scott Snyder, Joshua Williamson, and James Tynion IV. The comic is pure Morrison, going so far as to call back the evil super science squad from DC’s weekly 52 series from the late 2000’s! I won’t be adding the entirety of 52 to the essential background reading, but be aware that a lack of familiarity with the series will make this a tough read. Same goes for a lack of familiarity with the excellent Multiversity , which becomes increasingly important throughout the revelations of “The Wild Hunt” as well! If all that sounds like weird and wacky Grant Morrison writing you can probably skip, there’s a core portion of this one-shot that also delivers some of the biggest developments for the Justice League and Dark Batmen in all of Metal. It’s basically Metal issue #5 and one half. A wild ride that demands revisiting! I find the decision to release Batman & The Signal #1 prior to Metal #5 and Metal #6 extremely confusing. The issue clearly occurs in the aftermath of Metal. What was the rush to release this new series? The odd scheduling brings to mind Marvel releasing their All-New All-Different lineup prior to the conclusion of Secret Wars, semi-spoiling the outcome in the process. The upside of Duke Thomas’ debut as The Signal is that it serves as a reminder about all those developments for Duke (and, uh, The Joker?) teased in The Forge and The Casting. The metagenes have primarily gone unexplored throughout Metal #1 to #4. As it stands, it’s an average debut with promise, and should clearly be read after Metal. BATMAN: THE RED DEATH #1, BATMAN: THE DEVASTATOR #1, BATMAN: THE MERCILESS #1, BATMAN: THE MURDER MACHINE #1, BATMAN: THE DROWNED #1, BATMAN: THE DAWNBREAKER #1, THE BATMAN WHO LAUGHS #1 and DARK KNIGHTS RISING: THE WILD HUNT #1.
is actually called Dark Nights: Metal: Dark Knights Rising. Thank you. That’s what I was thinking when I clicked the link given, but I wanted to make sure. I would also include Crisis on the Infinite Earths and/or Infinite Crisis. 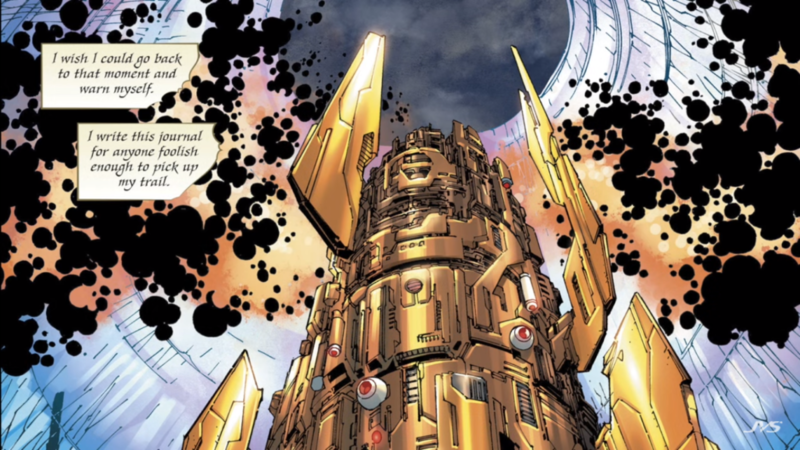 Anti-Monitor’s tuning forks play a large role. You should include Allstar Batman vol 2 Ends of the Earth. It is directly referenced in issue 1 of Metal. So I read multiversity and the return of bruce wayne…and pretty much hated both. Am I going to hate all Grant Morrison? It’s all I’ve read by him so far. Is it all that convoluted? I feel like you need to have a degree in DC comics and read it 5 times to gain any enjoyment. Didn’t feel that either were worth the time I put in. Alas. Altho I guess I did really like Arkham Asylum. Haha welcome to Morrison 🙂 Yeah, it can be a rough ride for many readers, and you sum up the crux of the issue in needing a degree in DC Comics (for some of his work). Return of Bruce Wayne in particular is *very* difficult outside the context of Morrison’s entire run on Batman (and frankly still difficult even inside context). On my end, the more comics I read, the more I love Morrison’s work. The depth of his superhero writing is extremely rewarding. But it took me a while to get there. I mostly liked All-Star Superman when it was one of the earlier books I read, and now it’s one of my 20 favorite comics of all time. At the end of the day, I can totally understand why you’d find those comics off-putting. Less convoluted works he’s written would include Arkham Asylum, his time on JLA, and (parts of) his Batman comics. Cool thanks! I’m sure I’m going to give most of his work a shot, just hope I come to enjoy it more like you say as I see all the praise he gets. So I plan on reading the essential background before diving head first into Metal (Hawkman Endless Flight, The Return of Bruce Wayne, all of the Snyder/Capullo New 52 Batman) but how much of the Convergence/Rebirth stuff do I need to read in oder to bridge the end of New 52 into the start of Metal? Just reading synopsis of Convergence/Rebirth is kind of making my head spin, so I’d like to avoid having to get into all of that, just to bridge into Metal, if I can. But, at the same time, I don’t want to be missing anything of importance that would make my reading of Metal less enjoyable. As someone who only read Marvel growing up, I LOVED it when New 52 launched, and I could jump into the DCU on a clean slate, without having to go back for decades to know what the hell was going on. I was all about New 52, until I heard what they were going to do with Rebirth, and then I fell off DC again. IMO Rebirth ruined everything, making it incredibly confusing for me, with the addition of all of the old cannon I’d never touched, but I guess I’m in the minority (which is why they did Rebirth to begin with). However, my first impressions of Metal are so positive, I’m willing to jump back in, but I want to know WTF is going on, and I don’t want to miss anything I need for Metal by glossing over Rebirth. Your thoughts interwebs? You definitely don’t need to touch Convergence. For any reason. Ever. Honestly, despite its status as a DC Rebirth event, Metal is not particularly reliant on Rebirth continuity. Everything that could be considered essential is included in the background or the road to Metal. I think it’s well worth the jump! 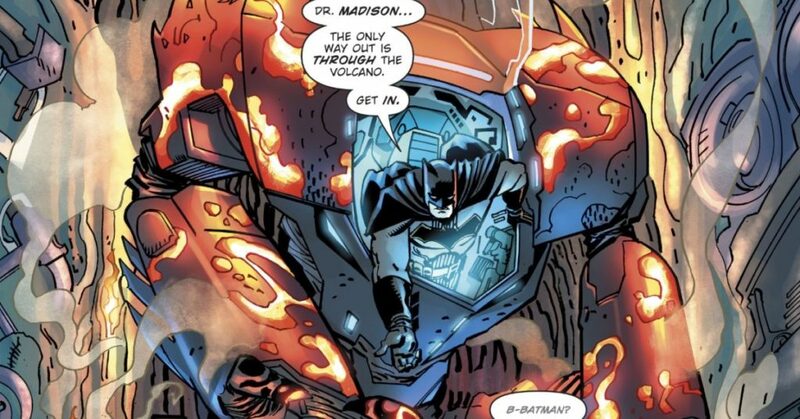 What about the All Star Batman Backupstory “The Cursed Wheel”? it says at the end tbc in Metal. How important is this really for the storyline? What is The New Age of DC Heroes? Is it actually tied to this storyline? he New Age Of DC Heroes is DC Comics’ latest publishing initiative which aims to add new corners and characters into the DC Universe. In doing so, we will see brand new heroes, or existing heroes with new roles or focuses. It’s not a relaunch or reboot, but a batch of brand new monthly comic book series. So I’m going to go out on a limb and say no. While characters and concepts might spin out of Dark Nights: Metal, the fact that many of these series are starting before the conclusion of the series means that it will probably not be essential. Think the silencer goes on sale January 31st and think The Immortal Men will be released March 14th. Still not sure bout The New Challengers, The Unexpected, and The Curse of Brimstone tho. There haven’t been any new issues since last update. Eagerly awaiting Metal #4 on 12/20!! Is Detective comics #959 worth getting along with #950 and Nightwing #17? If you’re a completist like myself, I’d say yes. If you just want to jump into Metal, then no. #959 is about half a good Zatanna and Batman team-up story, teasing Bruce’s exploration of Nth metal to come. I’ll be reading everything involving Metal anyway, but I’ll still check out this list since I didn’t read any of the New 52 comics (except Deathstroke that I recently started) and I want to read whatever you think it’s essential to understanding the story. I’m loving Metal a lot so far. I just re-read Nightwing #17 and Detective Comics #950 after seeing it on the list, and can’t figure out how Nightwing actually ties into the story. Any insight? Sorry if you have already answered this, but when you say to be familiar with the New 52 Batman, do you mean the entire run or can you survive with certain story arcs? I plan on reading it all eventually, just not sure how quickly I can squeeze in 52 issues before Metal is over. Thanks! From what I’ve read so far, make sure you’re at least familiar with Volumes 1, 2, and 7 from Snyder’s New 52 run. There’s a lot of references to Morrison’s pre-New 52 run as well, specifically “Return of Bruce Wayne” after the events of Final Crisis. Pretty new to comics, and figured I’d start here as it’s one of the more recent events. I get that it says “for die hard fans only”, but I’m a little confused about the very first link to Detective Comics. The linked book/TBP does not come out till mid 2018, but the issues it collects (963-968), as of 9/14 – only two of them have been published. Is it really a prelude if issue two of that collection (964) was published the same week as Metal #2? Wouldn’t we be seeing the events of Metal impact the events of Detective Comics published after it, like 965 (set to come out 9/27)? Hi Nick – great questions. I had an explanation all ready to roll, but as it turns out, I completely mixed up my links and info for that issue. Fortunately, DC has recently a “Road to Metal” trade that better sums up the oddball “tie-ins” of Detective Comics #950 and Nightwing #17. Detective #963 and #964 are a story about the Bat-villain Anarky, and as far as I can tell, aren’t Metal tie-ins. In general, publication date of a comic isn’t a guarantee for where it falls in the story timeline (hence the need for reading orders), but you’re not wrong for wanting that to be the case 🙂 So far, Metal has been pretty good about a chronological sequence – fingers crossed it continues! Metal has started out awesome. The forge and the casting were some of the best D.C. Comics I’ve read since the end of johns gl run. So how important is all the justice league and batman stuff from the new 52 or the beginning of rebirth? I am about halfway thru the new 52 gl stuff, and in the middle of “trinity war”. It looks like the rebirth stuff is cool, and I bought most of the early issues, but felt pretty overwhelmed and behind, so I never read them. I don’t want to spoil any awesome green lantern stuff of justice league stuff (in particular cosmic, or crazy event stuff). Do you think I’m safe, moving forward with metal? It’s just been so good! Also, I’ve never read the other Snyder D.C. stuff (I did read wytches tho, and liked it). Should I read it first, or can I still enjoy it later? I’ve always planned on reading it. My take is that Snyder and Capullo’s New 52 run on Batman is very relevant for this story. They’re trying to include enough of those details in exposition, but familiarity will definitely help. Maybe it’s the creative combo, but this event could almost be a part of the New 52 and I’d be none the wiser. So far I haven’t really seen GL or Justice League Rebirth references. The first non “event’ tie-in is out now in Teen Titans, and that definitely will make more sense if you have familiarity with where the book’s at in Rebirth. Although I certainly wouldn’t say you need to read all 11 issues to make sense of it.